Martyn Collins Digital and Social Media Marketing Services: Destination Branding - What's the Point? Destination Branding - What's the Point? The only destination brand I can remember! How many Destination brands can you actually remember? For me there is only one Destination brand that has ever succeeded in reaching any sort of mass recognition. Is a Destination Brand even necessary today? Are Destination marketers trying to play safe with traditional methods when the reality is that everything has changed about how a Destination should market itself? A Destination will reach more people through Social Media. Which today means the brand is Facebook, TripAdvisor, Google, YouTube, Twitter etc. Not VisitBland, DestinationDeadend, DiscoverSodall, ExploreOurNetherRegions* or whatever. If more Destination's concentrated on getting useful, relevant, timely information out there - where and when people need it - and forgot about expensive, traditional “brand” development then you might find a much more effective way of organically, naturally creating a brand. A brand that is defined by the people you attract to your Destination. A memorable brand. Of course I Love New York is a freak, a one-off and I don't honestly expect any other place to have the same success. And perhaps my point is that I Love New York is not a benchmark and that Destination marketing should not begin with the idea that they need to come up with some thing equivalent - development of a logo, font, colour palette, brand guidelines etc. The I Love New York logo became something much more than Milton Glaser or anyone else could have envisaged - it became something embraced by people - by NewYorkers, who adapted it for their own purposes (yet true to the original - no brand guidelines!) and made it become phenomenally, internationally successful as a consequence. And proliferate and enter the culture it did! The same Telegraph report goes on to say "Today, official merchandise stamped with Glaser’s design generates more than $30 million a year. According to the New York State agency that owns the copyright, and takes a healthy cut of the profits, the brand has grown in double figures in the past five years, and is especially big in Italy and Japan." I also believe that the "I Love New York" brand works brilliantly because it grew out of a need to bring New Yorkers together at a bad time in the city's history. It became a symbol that united New York's residents and helped build confidence in regeneration and civic pride. So don't get hung up on brand - especially if you haven't yet worked out what your story is and who you can get to help share that story with the world. 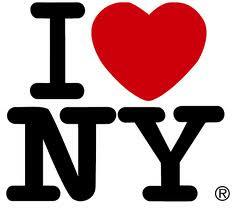 See the video of what Milton Glaser feels about the success of I Love New York. Of course if you can't beat 'em - plagiarise them! * apologies if there actually are Destinations out there called VisitBland, DestinationDeadend, DiscoverSodall and ExploreOurNetherRegions! @iVisitorGuide Have always thought destinations can't be "branded" in same way as companies or products - as nobody actually owns them !